With the last of my seasonal feijoas, I made this banana bread. A twist on the original, but with an added depth you don’t know you’ve been missing until you taste this loaf. It looks dense, but it has a beautiful texture which melts on the tongue. I can only attribute that to the feijoa pulp/puree that adds a unique but sweet flavour and the little black seeds you can see embedded throughout the loaf. It didn’t last long at all! And individually wrapped slices can be frozen and put into lunch-boxes for a treat too. 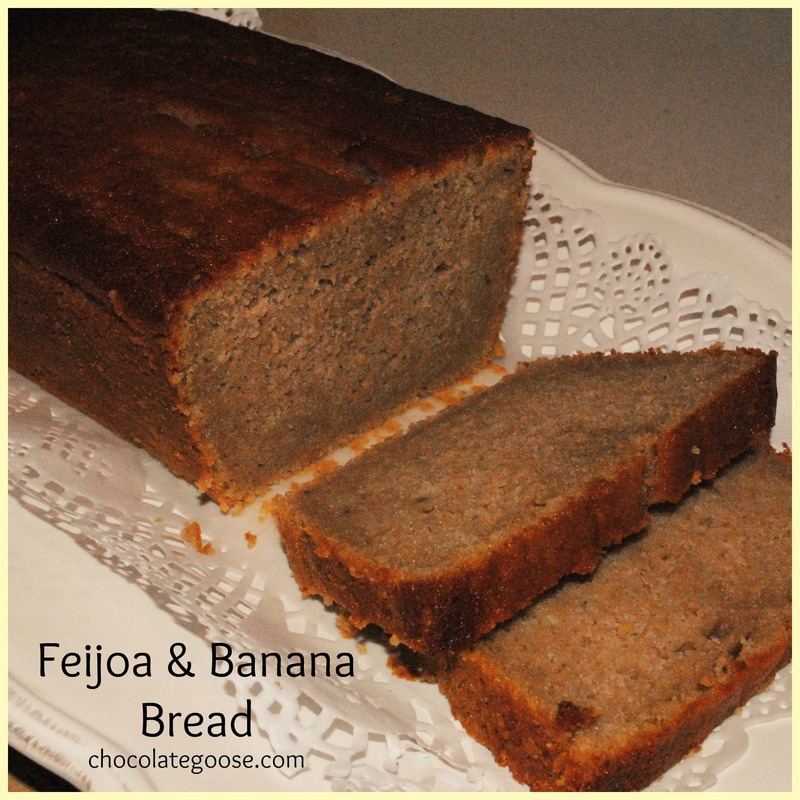 Although similar to my Easy Banana Cake and Buttermilk Banana Bread recipes, it’s a delicious alternative I can look forward to making next year during feijoa season again. Once sliced, you can enjoy it as is or spread a layer of butter thinly (or thickly, you decide) and savour each bite. A friend who visited over the Summer from Canada loved our New Zealand butter. I honestly take it for granted, but he would enjoy it on it’s own spread onto warm freshly toasted bread. Made me think about it and since then, I’ve done the same a few times. We truly are blessed with our locally grown and prepared produce in this tiny but self sufficient little country we call home. Warm banana bread straight from the oven is always a treat, but allow it to cool sufficiently as if it is too warm when you slice it, it may crumble a little. Preheat oven to 180°C, or 170°C if using the fan setting. Grease and line the loaf tin (makes a small loaf). Peel and mash bananas. Peel and slice or chop feijoas. Place into food processor along with all other ingredients except the flour. Process until combined. Sieve in the flour and process again briefly to mix well. Remember to close the lid first though – my processor doesn’t switch on unless the lid is engaged). Pour the mixture into the prepared tin and bake in the middle of the oven for 45 – 50 minutes until the top is golden brown and a skewer inserted comes out clean. Remove from the oven and cool in the tin for about 10 minutes before transferring to a wire cake rack to cool further.